What will happen to us when we retire is a natural concern that niggles most people. You might have been saving for your retirement since your early 20s, or maybe you started later but you made sure that you paid in plenty of extra to play catch-up. Perhaps you haven’t saved any income at all or you intend to just carry on working (a trend of many millennials who, according to a survey by Merrill Edge, would rather live the lifestyle they want now than save to retire). Or, maybe you had the best of intentions, but you had to cash in those hard-earned savings early. Nevermind planning for your own retirement, many people are blindsided by having to help pay for their parents’ needs ‒ perhaps even while bringing up their own children. This group is commonly known as the “sandwich generation”. The July 2017 Old Mutual Savings and Investment Monitor report found that almost 40% of South African parents surveyed said “my children should look after me when I’m old”. On the other end of the scale, a study by CreditCards.com found that almost 75% of parents in the United States have had to help their children with their finances. It’s clear that there is no plan that can be 100% set in stone. There are a hundred scenarios that could hinder your well thought out retirement plans. Many people see retirement as something older people need to worry about or believe that they’ll be able to “pull a rabbit out of the hat” when the time comes. But whatever challenges come your way, it’s important to think of the future. “Growing old is not an option. We don’t have a choice. But we do have choices that will greatly affect our quality of life for the rest of our life,” says Henry K. Hebeler in his book Getting Started in a Financially Secure Retirement: Pre- and Post-Retirement Planning in a Time of Great Uncertainty. In South Africa, life expectancy among the middle-class is about 79 years for men and 83 years for women. More than 6% of South Africans are over 60, with this figure expected to double over the next 30 years. While South Africans are living longer than ever before, and typically retiring much later, at some point past the age of 65 there inevitably comes a transition point where seniors either choose full-blown retirement or decide to downsize for a more manageable lifestyle. 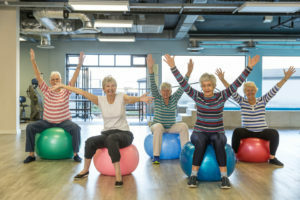 This has led to rapidly increasing demand from investors for quality retirement facilities, with many new estates already in development across the country. “Retirement homes and villages offer peace of mind for your older years. Especially in South Africa, with a volatile economy and issues around safety and security, you want to be certain that you have a plan that will take care of all your needs,” says Arthur Case, Chief Executive Officer of Evergreen Lifestyle. Evergreen Lifestyle estates operate on the Life Right model, which grants the buyer and their partner the security of guaranteed lifetime occupation. The key benefit of this model is that the owner of the Life Right is not accountable for all the responsibilities for maintenance of that property and the common areas in the estate. “We have found that our model eases many financial concerns of our residents, and offers potential long-term savings for families who are assisting them. A Life Right does offer a safe haven for life, but it also costs less than a market-related property. You also know exactly what you’re in for in terms of costs. You won’t have sudden excessive maintenance costs, or the burden of having to deal with such admin. And if, for example, a Day Zero scenario were to occur in South Africa, you know your water needs would taken care of. Likewise a host of other risks are taken care of by Evergreen. “This is appealing for the elderly who do not wish to take on such responsibility and would prefer not to deal with other issues linked to full home ownership, such as insurance and security. Medical costs and frail-care are also at a lower cost to residents, compared with similar quality facilities at a hospital or private frail-care unit. This is refreshing news for those who fall in the sandwich generation, of course,” says Case.